Not sure how to get started on your new fence project? We’re here to help with this comprehensive fence planning and installation guide. If you are unfamiliar with fences, let’s take a look at their basic structure. A vertical support element that defines each section of a fence. Design cut into the top of a post. A fitting that covers the top of a fence post. A horizontal support element to which fence boards or pickets are attached. The distance between rails is known as rail spacing. Rails can be located at the top, middle, or bottom of a fence. 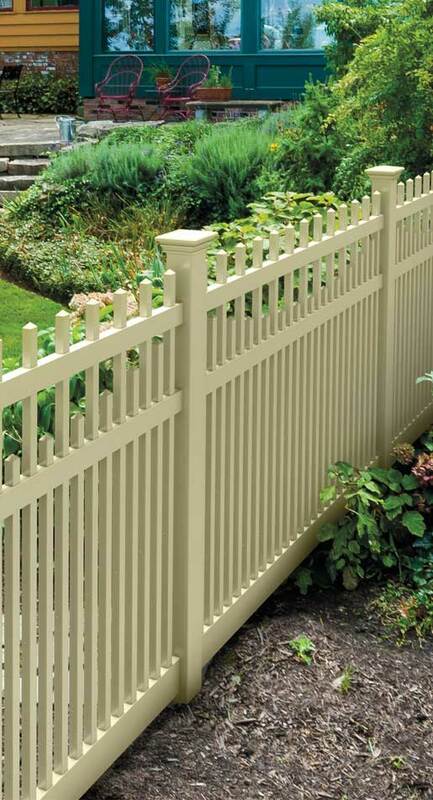 A vertical fence board or element that attaches to the rails and are usually evenly spaced. These are the individual fence sections that include the posts, rails, and pickets. Allows entry into your yard. Some homeowners refer to these as doors. The best place to start is by asking yourself why you need a fence. Next, research the types of fences that work best for your needs. 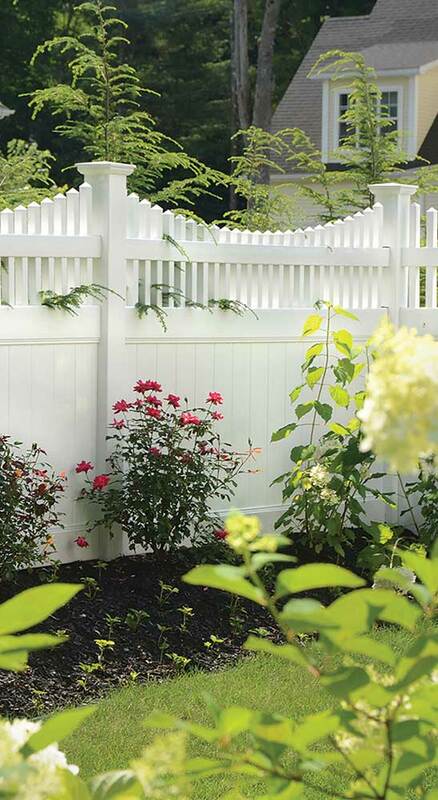 A decorative fence can enhance the look of your home. 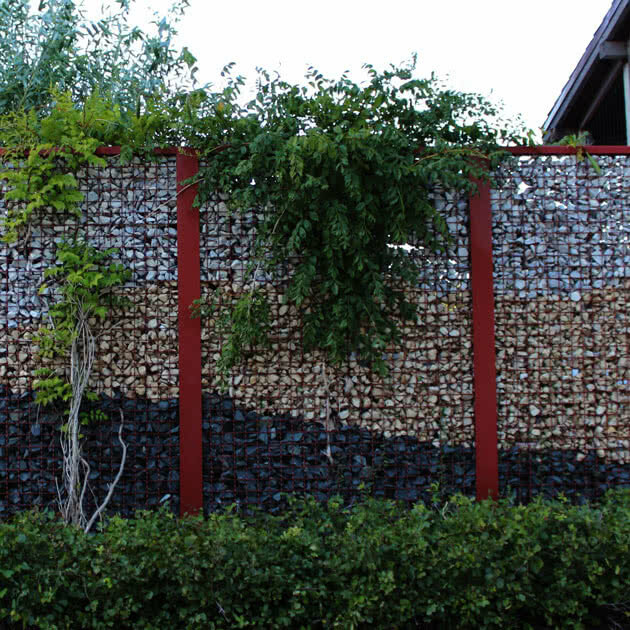 Learn more about our Decorative Fences. There are a variety of options to help keep kids safe in your yard. Learn more about our Security Fences. Choose a fence based on your dog’s size, jumping ability and willingness to bark. 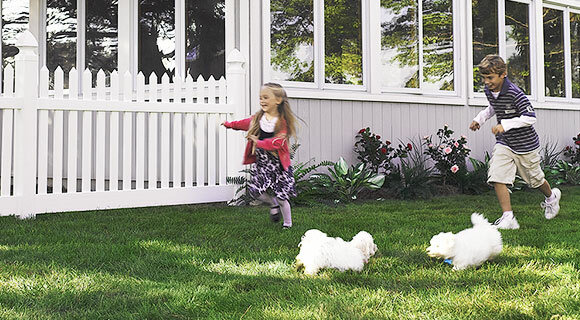 Learn more about our Dog Fences. Maintain your privacy with fences that provide both function and decoration. Learn more about our Privacy Fences. 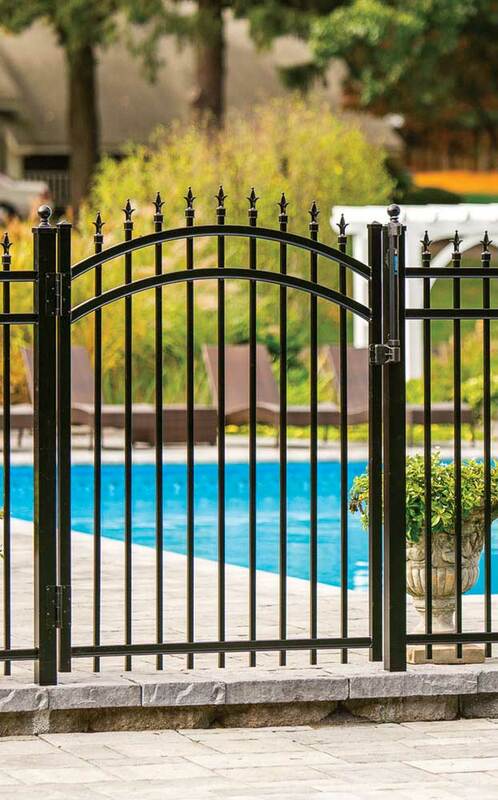 Surround your pool with fencing that meets city building ordinances. Learn more about our Pool Fences. Ensure that your horses stay on your property. Learn more about our Horse Fences. Learn more about our fencing solutions at our Residential Solutions Overview. How much are you willing to pay upfront for your new fence? Lower cost fences (e.g. wood) need more ongoing maintenance than higher cost fences (e.g. aluminum, vinyl) with low maintenance requirements. Some zoning ordinances may limit fence height, style and location. Most HOAs have guidelines, including board approval, in their bylaws. Each product has a variety of options and colors, so choose one that best fits your style. You may want to keep with the look and feel of your neighbors. 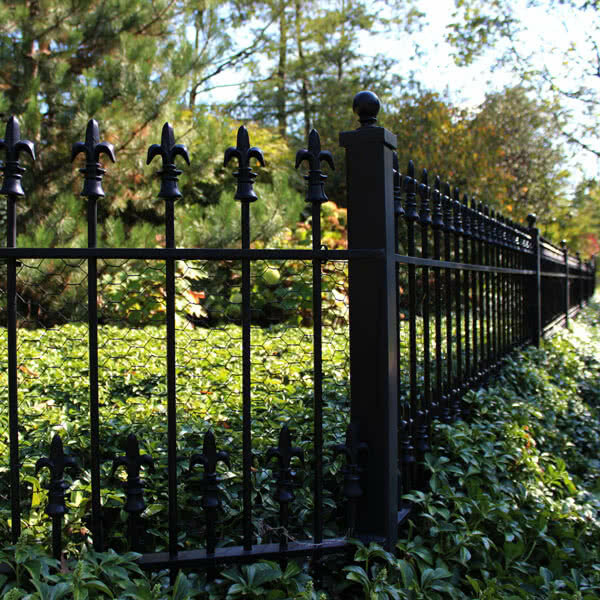 Learn more about our fencing products at our Residential Products Overview. Meeting face-to-face with one of our sales reps is the best way to determine the cost of your new fence. Simply Schedule an Estimate and we’ll reach out to you within 1 – 2 business days to set one up. You can expect the appointment to last approximately 1 hour. It is helpful to have a copy of your plat of survey available at the time of your appointment. This is a scaled map of a property drafted by a registered land surveyor that shows property boundaries and all of the structures on the property. We will use this to determine where we can install the fence on your property. Can’t find yours? Plat of surveys may also be held by your mortgage company, a government agency that issued a previous building permit or the land surveyor who prepared it. You can check with them to see if they have a copy, or you may have to contact a surveyor to create a new one since this is a required document for your installation. Here’s where we learn about you and your needs, and then we’ll discuss your fence options. Your sales rep will first walk your yard with you. They will look for any environmental concerns (hills, slopes, etc.) and any other obstructions (trees, utilities, etc.) that may affect your fence design, suggested product, and installation. They will also look for where you may need gates and discuss their placement with you. Finally, your sales rep measures how many linear feet of fencing is needed. Next, the sales rep will want to learn about why you need a fence, your budget, your level of expected maintenance, and any building restrictions. These factors will help determine the product types that are the best fit. Now you get to let your style shine through! Each product type has different styles of posts, pickets, rails, and caps as well as several color options to choose from. You will also be deciding on your gate style, latches and locks, and associated hardware to complete the design of your fence. The last step is getting your estimate. You should get one at the end of your appointment, but if more time is needed, your sales rep will let you know when to expect it. You’ve made a great decision in choosing Peerless Fence Group for your new fence! Before we can schedule your installation, there are several required documents you need to get and send to us. A signed contract, along with a 50 percent deposit, is the first step to getting your project moving forward. Once these are received, we will order the materials for your fence. You must contact your city, township or county for permit requirements, where to apply, approval timeframe, and costs. Most municipalities will require that your drawn fence plan (which is included with your estimate), along with a copy of your plat of survey, be submitted with your permit application for review. Note that if you are also getting a pool, this plan needs to be submitted as well. Expect the process to take anywhere from a few days to 4 weeks. These wait times are determined by the municipality. If you live in a community with an HOA, you will need to submit the plans for board approval. Expect the process to take approximately 2 – 4 weeks. Your permit, HOA approval (if required), and plat of survey must be on file with us before we will schedule your installation. Once we receive the required documents and your materials are received at our yard, we will contact you to schedule your installation. It is required that a property owner be home during the installation as well as be available onsite with our crew at the start of your installation and when it is completed. While every attempt is made to install your fence on the scheduled date, dates are subject to change based on weather conditions. Our operations staff will keep you informed if any changes are needed. We will contact JULIE/DIGGER to locate and mark your public utilities such as cable lines, power lines, and gas lines. We follow the markings to do our best to not hit these lines during your installation. All private utilities are the homeowner's responsibility to locate and mark. We are not liable for any damages to private utilities that are not located and marked or marked and not moved out the the fence line. Private utilities include electrical lines to outdoor lighting, power to a back garage, sprinkler systems, drain tiles, septic fields, invisible dog fencing, private gas lines, etc... If you have questions about what qualifies as a private utility, please contact our office. Because we are digging into your yard, any private utility in the way of the fence line will be hit during installation. To avoid damage to the utility, you will need to have the utility relocated out of the fence line. You need to have this completed before our installation date. You can see if we can move the fence line away from the utility. This may not always be an option depending on your property line. We want to protect your property from damage and keep our crew members safe. Please remember to mark your private utilities. If you have landscaping near where your fence is being installed, we suggest that before our arrival you either trim or relocate any plants, trees, shrubs, or flowers that could get damaged during your installation. We do not have proper tools to do this without possibly ruining your landscaping. If you haven't already, you should let your next-door neighbors know when you're having your fence installed. This way they won't be surprised by our crew's activity in your yard. You or another property owner/decision maker must be home for installation. We find our customers are most satisfied with their fencing projects when they are home and available for any questions our crew might have throughout the day. Below is the timeline you can typically expect once our crew has arrived to install your new fence. Our crew will need access to water and electricity. It is recommended that you turn off your private utilities. You will need to allow for roughly 15 minutes to review the job scope and layout with our crew. You will also need to confirm the placement and swing direction of any gates. If you have an existing fence that we are contracted to remove, we will tear it down before we begin any new work. We will also haul it away upon completion of your new fence installation if this is in your contract as well. All of the fencing materials will be moved into your yard by our crew at the start of your installation. Our crew will follow the drawn plans on your contract, along with your plat of survey, when installing your fence. They will also follow the markings for both public and private utilities and will do their best to not hit these lines during your installation. In the event something has been hit during installation, do not panic. Call our office at 800.543.6511, and we will work with the utility carrier to resolve the issue. The crew will walk the job site with you and review the installation. You will need to let them know of any concerns or questions you may have at this time. The crew will address your concerns while onsite or will advise if a return trip will be necessary. If you notice something at a later time that concerns you, please contact our office at 800.543.6511 so that we can review your concerns and work with you on a resolution. The crew will then ask for you to sign off on your project. Payment is due upon completion. Please give our crew your check or call our office at 800.543.6511 to pay by credit card. We do not keep any credit card information on file. Keep this in mind: As with any outside construction, you will be able to tell that there was work recently done in your yard. You can expect to have left over dirt from the post holes in your yard, the grass matted down from the materials and the crew, and you may have landscaping damage if it was not moved away from the fence area. Also, the areas near to your installation will be muddy if it has recently rained. We make every effort to leave each site as we found it, however, there is some messiness that is unavoidable. Relax and enjoy your new fence knowing that our Labor and Material warranty programs offer worry-free protection. Don’t forget that most of our fences require registration with our suppliers in order for your fence to be covered by their warranty. For more information, visit our warranties page.